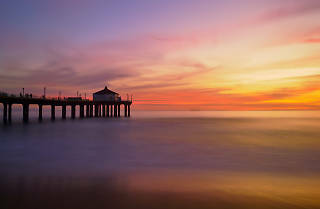 There are many ways to explore Manhattan Beach, but there’s only one perfect way to spend a day in the beachfront city. 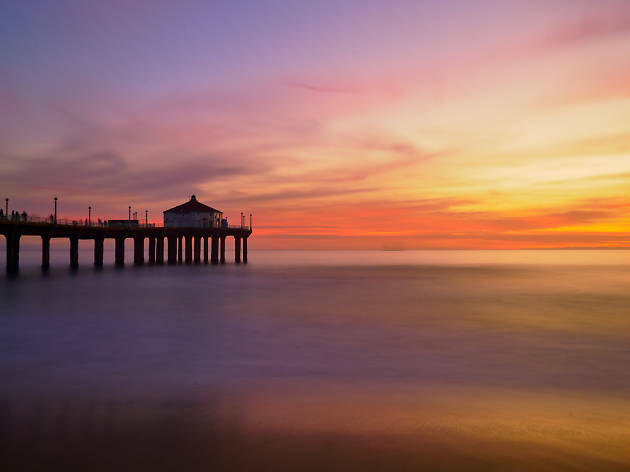 We’ve put together an itinerary for your perfect day in Manhattan Beach. The weekend brunch menu at Manhattan Beach Post is reason enough to visit the posh beach city. Start your day gabbing over ricotta-stuffed French toast, truffle-honey–laced fried chicken and bacon-cheddar buttermilk biscuits. Stroll past the surf shops, boho boutiques and athleisure stores that line Manhattan Avenue and Manhattan Beach Boulevard, then burn off those breakfast calories with a walk or bike ride along the Strand. Make sure to meander up the mansion-lined side streets that intersect the coastal pedestrian pathway. Watch surfers carve the curls or slip on a wet suit yourself at El Porto Beach, known for its blessed breaks (just ignore the industrial backdrop). Crest the hill for a seafood lunch at Fishbar, where the maritime-kitsch decor is laid-back but the fresh, flaky fish-and-chips means business. Before returning downtown, detour a few blocks inland to Sand Dune Park, which beckons hikers up its 100-foot-high shifting incline. Watch the sun set over the Pacific Ocean from the end of Manhattan Beach Pier before walking over to dinner at Little Sister, where creative Southeast Asian recipes are channeled through an easygoing South Bay sensibility—just make sure to save room for the dessert medley. You could spend twilight sipping a cocktail in a showy lounge, but we recommend holing up in Ercoles 1101, a beloved, dimly lit dive that’s 91 years old.